It can be tricky to keep your house up to a certain standard. There are so many skills to refine. You have to have a green thumb, the ability to bake, and a way with decor and design. This is no different when you're keeping a house of horrors! You've got to keep your deadly nightshade healthy and your Venus Flytrap well-fed. There are spider-shaped cupcakes to bake and frost. And creepy decor, well that's a real art all on its own! 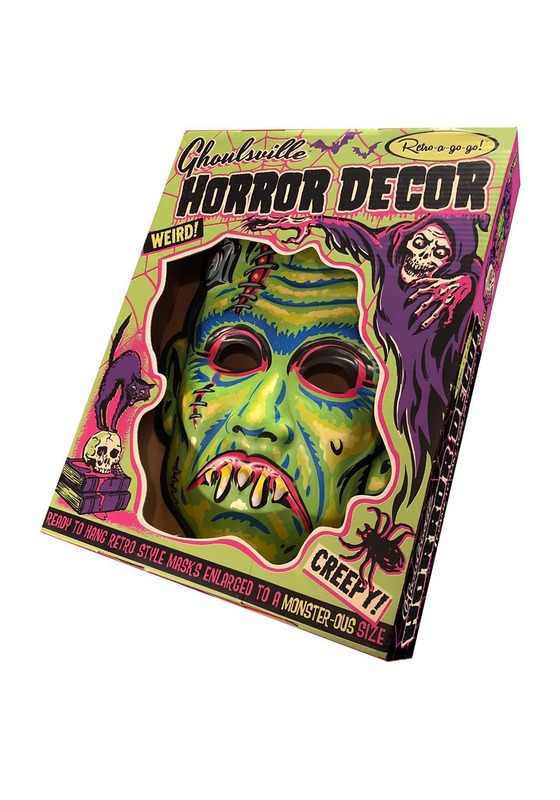 This oversized mask has a three-dimensional flair and is painted with bright, tiki style colors that look like they're straight out of a horror comic book. Son of Frankenstein has horrific teeth, pink scars, and the classic green Frankenstein's monster hue. Hang it easily from the hole in the back and watch as good ol' Frank brightens up your gloomy affair! While ghosts and witches are cool and all, there's nothing like a classic monster that'll stir up the happiest Halloween feelings. You can go so many ways with making your home seasonally spooky. If you want to stick to the guide to ghoul housekeeping, you're going to want decorations with a cheerful yet retro flair!